The World Baseball Softball Confederation (WBSC) has announced that broadcast rights have been awarded in territories across the world for the first-ever WBSC Premier 12 global baseball championship, which will be staged from 8-21 November in Japan and Taiwan and will feature the National Teams of the Top 12 countries in the world. Australian just misses out on a spot in the global competition as it sits at #14 in the world rankings. In Oceania, global sports network beIN Sports has been awarded Premier12 broadcast rights in Australia. In Europe, cable giant Fox Sports has been awarded the rights to broadcast the new international baseball flagship tournament in Cyprus, Greece, Israel, Italy, Malta, Netherlands and Turkey. NOS, the Dutch free-to-air public broadcaster, has also been awarded Premier12 broadcast rights in the Netherlands, the No. 5 country in the WBSC Baseball World Rankings, while Eleven Sports Network has obtained broadcast rights across Belgium and Poland, as well as Singapore and Malaysia in Asia. 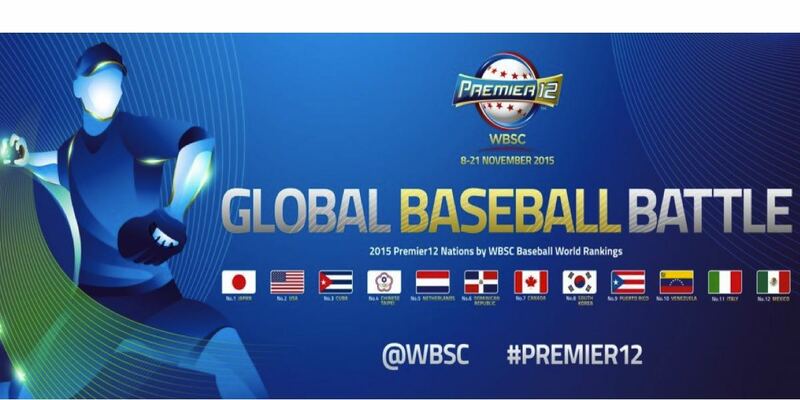 WBSC Premier12 broadcast distribution across Asia also includes beIN Sports (Indonesia and the Philippines), LeTV and PPTV (China), Macau Cable, Sky Net (Myanmar), Solar (Philippines), i-Cable (Hong Kong) and Vietnam Digital Television (VTC). Japanese satellite TV network J-Sports has also acquired broadcast rights for the WBSC Premier12, adding to the already announced agreements with TV Asahi and the Tokyo Broadcasting System (TBS) in Japan. Camerabay.tv has obtained online broadcast rights in Taiwan, which complements host broadcaster Videoland’s television rights in the nation. Videoland will be producing 33 (of the 38) games of the 2015 WBSC Premier12 within the span of a week, marking the most intense operation in history for the premier sports network in Taiwan. It was already announced that SBS in South Korea has been awarded the exclusive broadcast rights in that nation for Premier12. Across the Middle East and North Africa (MENA), Dubai-based OSN added the WBSC Premier12 to its broadcast portfolio. In the Americas, Rogers’ Sportsnet (Canada) and the Cuban Institute of Radio and Television (ICRT) have been awarded exclusive rights in their respective territories. All 38 games of the 2015 WBSC Premier12 will be live-streamed and free-to-view on the WBSC YouTube channel for those territories not covered by WBSC’s broadcast partners. Following each game, highlights and video-on-demand will be available to worldwide audiences via WBSC’s YouTube channel.